Successfully Added Talking Digital Tire Pressure Gauge - PSI / BAR, Glass Hammer, 5 Multi-Tools, LED Flashlight, Backlit LCD Display to your Shopping Cart. Measuring your tire pressure has never been easier than with this talking digital tire pressure gauge that will read out the pressure in English as well as display it on a backlit LCD screen in either PSI or bar. Measuring the pressure up to 150PSI and accurate to within 1 PSI this digital pressure gauge is ideal for use in low light conditions and the easy to grip housing makes it quick and easy to use. With an automatic shut-off, this tire gauge is suitable for light trucks, cars, SUVs and motorbikes bringing accurate readings in seconds. 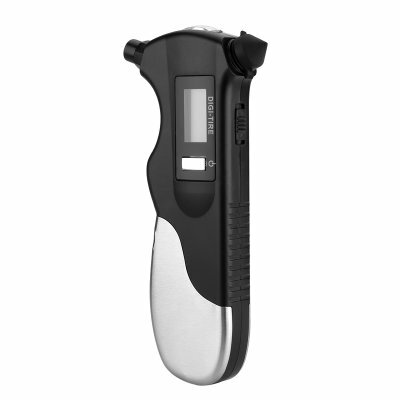 The digital tire gauge is also a lifesaving device, with its multifunctional uses. A built-in windscreen hammer provides a lifeline in case of emergency while a serrated edged folding blade will slice through a seat belt like butter, allowing you to quickly escape from a vehicle in case of emergencies. There are plenty of additional functions as well, with the slotted screwdriver you can check the tread depth on your tires ensuring they are not unevenly worn or pose a safety risk. A built-in LED light will bring up to 10 hours of illumination so whether its reading a map in the dark or changing a tire you will be able to see clearly. Running on a single AAA battery (not included) this compact digital tire gauge is the perfect accessory to keep in your glove box. The digital voice tire gauge and multi-tool comes with 12 months warranty, brought to you by the leader in electronic devices as well as wholesale car gadgets..
5 tools: Bottle opener, slotted screwdriver (tread depth gauge), Phillips screwdriver, seat belt cutter, knife.